1 in 2 men and women will have cancer in their lifetimes; 30 years ago it was 1 in 10. The Framingham Study demonstrated that people who eat 6 servings/day of fruits and vegetables have 44% less risk of stroke; 9 servings/day yields a 66% reduction! The current Dietary Guidelines for American recommends adults consume 9-13 servings (4.5-6.5 cups) of fresh fruits and vegetables every day and more for athletes. Even small children should eat 7 or more servings every day. YET, 95% of Americans are not getting 7-13 servings of produce a day! 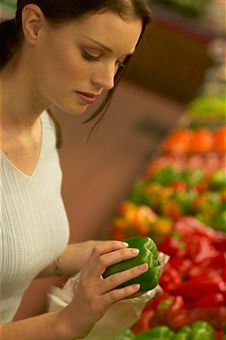 In fact, only $50 is spent by the average American family on fruits and vegetables each month. That's less than $2 per day per family! (2007 US Census Bureau) If they were getting their 7-13 servings they would be spending $10-15/day. And CHILDREN? Obesity is epidemic; 1 in 2 will develop heart disease; 1 in 2, cancer! Degenerative diseases of the aged are now evidenced in children. ADD and ADHD are on the rise! WHY? A study of 3112 children grades 2-6 proved almost half didn't eat even 1 fruit or vegetable in a day! FOOD IS FUEL, and they are running on empty! They need to be RAW because enzymes are only found in RAW foods. Enzymes act as catalysts for the thousands of functions every second that our cells undergo. They strengthen the immune system, defy aging and detoxify the body. Cooking deactivates enzymatic activity. Meat is cooked, milks and juices are pasteurized, grains are baked and nuts are roasted. Fruits and vegetables are about the only other sources of enzymes and even then we cook most of them. VARIETY is important because everyone absorbs nutrients differently. Your body may absorb calcium beautifully from broccoli, but I may need to get it from spinach. Kale is the #1 anticancer vegetables and I don't eat it, do you? Since each fruit and vegetable has a unique composition of phytochemicals, vitamins, minerals, enzymes, and trace elements, and since most people only eat the few fruits and vegetables they like, they may be missing some important fuel. Not only does a VINE RIPENED tomato (for example) taste delicious, but also the bright red coloring is indicative of the rich phytochemicals inside. Vine-ripening not only creates MORE nutrients, they are absorbed better. Produce needs to be FRESH or nutrients are lost. How much truly FRESH produce do you eat? There is also solid evidence that the fruits and vegetables bought in the store today don't contain the NUTRITIONAL VALUE they had about 40 or 50 years ago. And, when it comes to superior taste and nutrition, fresh fruits and vegetables from the garden are always best. But by the time your "fresh" produce reaches your local grocer, it has had plenty of exposure to air, heat and light -- enough time to diminish its nutritional value even more. This means, short of growing our own produce in perfect conditions, we need a better solution. Juice Plus+ is WHOLE FOOD: It is composed of 30 RAW fruits, vegetables and grains which are grown in nutrient dense soil, allowed to ripen on the vine and picked/processed quickly! It was developed to fill the GAP between the quality and quantity of what we ACTUALLY eat and what we NEED to eat for good health! We are so glad we have Juice Plus+ as a part of our regular daily healthy lifestyle<>. How about you? eventually your body will control your lifestyle." 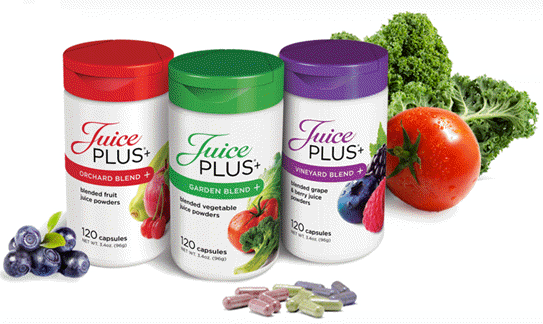 Juice Plus+ is now 25 years old and is the world's most thoroughly researched wholefood-based nutritional product. It helps us bridge the gap between what we do eat and what we need to eat, in terms of daily fruit and vegetable intake. Many have turned to juicing as a solution; God bless them! But: Juice Plus+'ing is better than Juicing! And Juice Plus+ gives you the nutrients of 20 fruits, vegetables, and grains (30 if you also take the Berry Blend) without all the sugar!